The solar age has dawned in Germany. About 20 percent of the country's rooftops are suitable for solar power production, according to recent results from the SUN-AREA Research Project. The project aims to determine how solar energy resources can be optimized by placing photovoltaic panels on rooftops around the country. SUN-AREA researchers used ArcGIS Desktop applications to calculate the possible solar yield per building for the city of Osnabr�ck. The SUN-AREA project is sponsored by the University of Osnabr�ck and the TOPSCAN topographical information company. It is led by geomatics engineer Martina Kl�rle and researchers Dorothea Ludwig and Sandra Lanig. Preliminary findings of the SUN-AREA project estimate that, at full potential, solar power could meet the entire energy needs of homes throughout Germany. The team began its work with an examination of the northern German city of Osnabr�ck. "We have proven that 70 percent of the city's total demand for electricity can be covered using only the roofs that are already present in Osnabr�ck," Kl�rle says. "In other words, if all the roofs that are especially suitable were now fitted with photovoltaic devices, we could meet 70 percent of the electricity needs of all of Osnabr�ck." Germany is very well suited to generate electricity using photovoltaic systems. The majority of the population is not concentrated in urban centers, but spread out over rural areas. That means more space per person, and more roof area. "My vision is to use all suitable roof surfaces to make solar electricity," Kl�rle says. Now Kl�rle is trying to turn the SUN-AREA vision into reality. She gave city officials a solar power potential map of Osnabr�ck with an exact catalog of all suitable rooftops. The data has been made public and has already received positive response. The city is stepping up efforts to equip public buildings with solar collectors. Osnabr�ck has doubled its solar energy installations in the past year alone. "We're at the point where we can't afford to get our electricity from coal-fired power plants, and we don't want to get it from nuclear power plants," she says. "I just won't accept that we have all this potential on our roofs, and we don't use it." 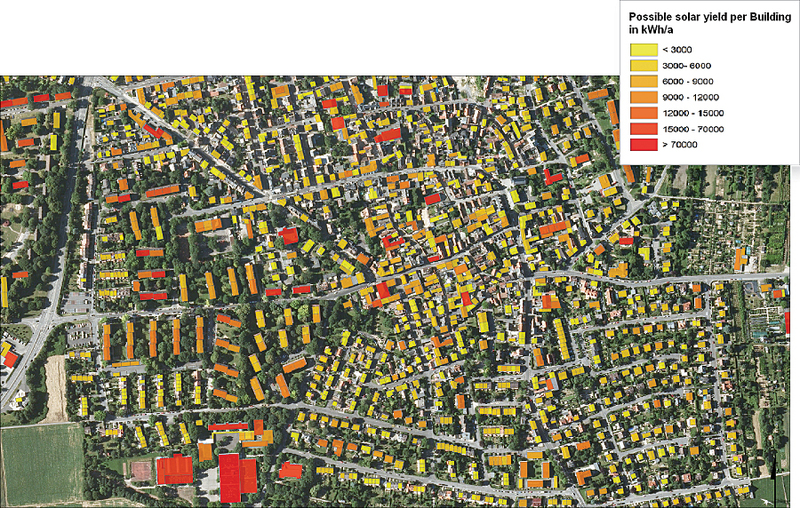 SUN-AREA researchers set out to develop solar power potential maps of each roof area, each city, and each county or district in Germany. The team started by gathering data, then devised a digital analysis method for identifying high-potential areas. Rooftop data was collected with aerial laser scanners. Kl�rle spent time flying through the skies over Germany, seeing to the effectiveness of the scanning technology. Using ArcGIS Desktop tools, including ArcGIS Spatial Analyst, the researchers identified all necessary rooftop data, such as outer form, inclination, orientation, and clouding. 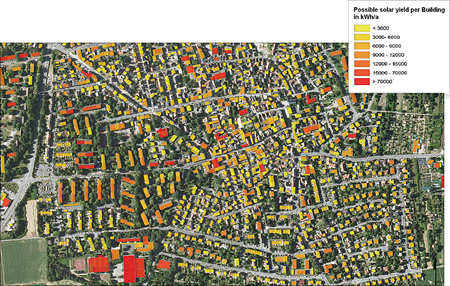 The team used an algorithm sequence, created with the ArcGIS Desktop ModelBuilder application, to determine the solar potential of all roof areas. Important data included the angle and alignment of the roof, the sun's path across the sky, shadows cast by a chimney or another rooftop over the course of the day, and the seasonal change in hours of sunlight. The SUN-AREA project also calculated solar suitability, potential power output, CO2 reduction, and investment volume for each subarea of a roof. The ModelBuilder application gave the team an intuitive interface to implement necessary data and tools to model solar power. The system detects optimal locations for producing solar power based on laser scanner data and plain view data. The results from the Osnabr�ck pilot region are available to the public via an interactive online map created with Esri's Web GIS technology (www.osnabrueck.de/sun-area). For more information, contact Dorothea Ludwig, researcher, SUN-AREA Nord, Fachhochschule Osnabr�ck (e-mail: d.ludwig@fh-osnabrueck.de), or visit www.osnabrueck.de/sun-area.